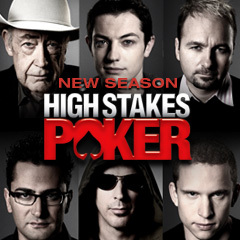 For the second straight week a player on High Stakes Poker has been felted, losing their initial $200,000 buy-in. In week one it was the poker pro everyone loves to hate, Phil Hellmuth who went busto: Week two of the popular television show saw Andreas Hoivold take an early exit from the game. In the most interesting hand of the evening viewers were able to get a glimpse of the ultra-aggressive style of play that has taken hold at these limits: The hand in question saw Gus Hansen –who is definitely not a passive player—smooth-call a raise from Daniel Negreanu with AK. Hansen was likely looking for a raise from one of the young aggressive players still to act, but instead saw two more raises! Tom Dwan was the first to pop-it, with an unexciting K5s, only to be re-raised by Dario Minieri and his pocket Tens. Dwan was probably trying to take the pot away, and Minieri likely thought Dwan was trying to take the pot away! Unfortunately for Gus his well laid trap had to be discarded, and he simply mucked his AK. The table talk also took an interesting turn, with players mentioning everyone from Isildur1 to WSOP champion Joe Cada. As usual, the criticism was rampant, and the needling kept up almost nonstop. This entry was posted on Tuesday, February 23rd, 2010 at 8:21 am and is filed under Poker News. You can follow any responses to this entry through the RSS 2.0 feed. You can leave a response, or trackback from your own site.